The National government says Auckland needs more land for more houses. The Mayor says Auckland needs more affordable houses... and "to unlock new land by fast-tracking consents for development" and is intent to run with National's Apartheid-sounding 'Special Housing Areas' to achieve it. Auckland doesn't need any of this of course: it is lumped with the influx of the majority of immigrants into the nation whether the city wants them or not - that is where the demand arises - from central government policy, not natural population increase. Auckland's land/housing problem is a population question, an immigration question, and ultimately a colonial question. 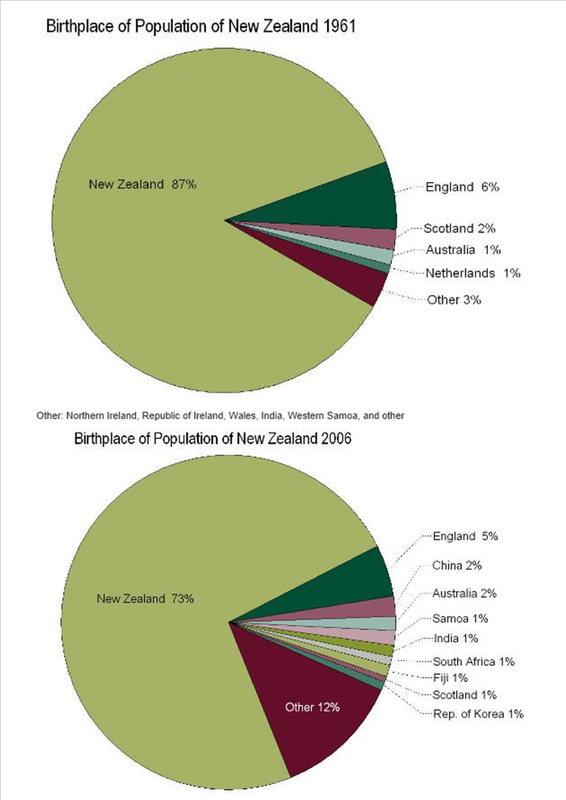 NZ has a more colonial demographic now than it had even before WW2. Only 73% of the population were actually born in this country and that was the figure from 2006. Now it will probably be closer to 70%. In many parts of Auckland immigrants now make up most of the population. 2nd+ generation Pakeha (those with no immigrant parents) have been in a minority of the population for some ten years or so. This is radical change. Since the passing of the immigration reforms of 1987 more immigrants have settled in NZ than the entire Maori population. The stats officials studiously avoid any population projection beyond 20 years (and the Auckland Council officials beyond even ten years!) because they will show at some point that the non-Europeans will be in the majority and this will alarm the Pakeha population (particularly the working classes locked out of home ownership and facing impaired career prospects due to the competing immigrants). The political and social tensions this will cause are more latent than apparent at present and there is an expectation the stability and appearance of social cohesion will continue without any particular effort. In other words the classic, short term 'she'll be right' attitude upon which so many a disaster has begun. All these houses that are needed immediately and needed into the future are needed for foreigners. No-one in Auckland politics is willing to challenge this central government policy. The reasons for this acceptance are also ultimately colonial: the self-interest of the established Auckland settlers in increasing the value of their property and the value of their businesses. As long as the Pakeha position in the pyramid is above the new entrants then they have an incentive to support the pyramid-building - as does the next cohort of new settlers. The routine property covers in Metro and the NZ Listener are constant reminders of that middle class aspiration and the dominant focus of Auckland. But eventually the pyramid sceme - because it relies on adding an exponentially growing volume of people to maintain the level of windfall gains on the value of the scarce resources held by these incumbents - must prove unsustainable and will collapse at some point. But what will NZ look like at that point? The property system is itself supported by the democratic political system, both of which can only function if Maori are in the minority which is why the NZ government's land wars and wholesale confiscation were followed by massive immigration (and massive borrowing from which the state has never recovered). If Maori ever become the majority, again, then amongst a host of cultural and language changes they will deconfiscate their whenua and the superstructure of land ownership will change. This is normal in a decolonisation process (New Caledonia/Kanakia is an interesting example in the Pacific of a staged decol) but most NZers (incl. many Maori) do not view NZ as a colonial entity even though they cannot determine at what point "independence" happened and even though they may accept the individual elements of a settler/colonial regime still persist (but not the corollary that it functions as a whole system). Over time, with mixed marriages, this transition will occur. However that jeopardy to the settler system is kept in check by immigration. As the European population's natural increase drops their government must find more non-Europeans to negate the higher birth rate (and longer life expectancies) of Maori. The Immigration reforms starting in 1987 was precisely the vehicle for that. I am willing to bet that it was plus or minus three years from that date that this country reached the highest point of NZ-born population. Despite this the Maori population managed to increase, slightly, as a proportion of the whole. Now look where we are and wait for the results of the delayed census from earlier in the year to see if Maori have in fact gone backwards over the last seven years. Then where will all the glib assertions about a Maori resurgence and a bi-cultural nation be? Relegated to a permamnent minority in their own country with a government aim to keep it that way is where this leads. Where will that leave the Treaty process? Any future settlement with the NZ government should make it clear that they have forfeited their rights to immigration by flooding the country with so many foreigners in such a short period. How can we resolve a constitutional conflict when one side is pumping 45,000 people - almost the size of an electorate - into the conflict zone each and every year? They will fill the country with another amount the equivalent of the entire Maori population in the next 15-20 years and no one thinks this is an issue?